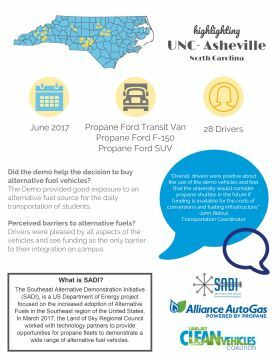 Thanks to UNC Asheville and the other organizations in our region that participated in the Southeast Alt Fuel Vehicle Demonstration Project (SADI). The goal of the 3 state project was getting folks into AFVs for multi-day test drives to acquaint them with the vehicles and learn about the benefits of driving a low emission, fuel efficient vehicle. Other fleets participating in WNC included the towns of Waynesville, Canton, Black Mountain, and Mars Hill, Henderson and Jackson Counties, Buncombe and Madison County Sheriff Departments, Blue Ridge Community College and the Biltmore Estate. Special Thanks to Alliance Autogas and ICOM for providing the propane autogas vehicles. The project was funded by a grant from the US Department of Energy Clean Cities Program and administered by the Triangle Clean Cities Coalition. Others interested in test driving an AFV should contact Bill Eaker at 828-734-7434.